Most packaged food we consume nowadays is processed at factories around the world. And these factories generate a lot of wastewater in processing this food. And treating the effluents in this wastewater generally demands a large input of chemicals. The sustainable solution is for food processing plants to use biosolutions for wastewater treatment. Not only are they more effective, biosolutions also reduce the environmental impact of wastewater treatment. Our clients – one of India’s most renowned confectionery and edible oil manufacturers – were in a similar boat. Traditional wastewater treatment solutions at their plant in Maharashtra were resulting in high levels of COD. 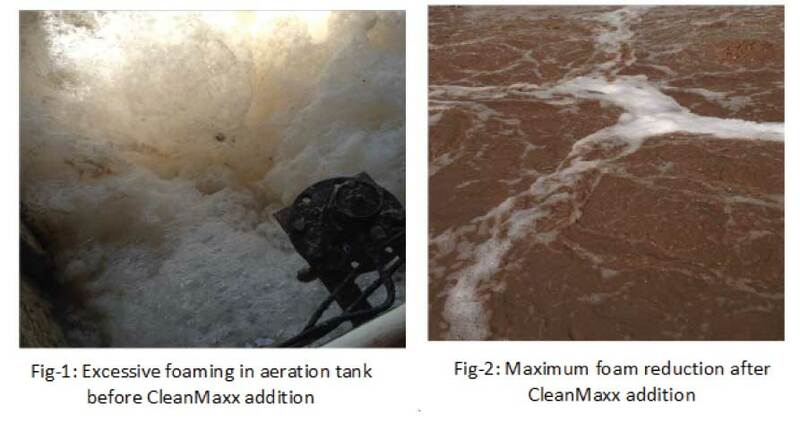 Excessive foaming in the aeration tank and high concentration of oil and grease were other concerns highlighted by their wastewater treatment team when they approached us for a solution. 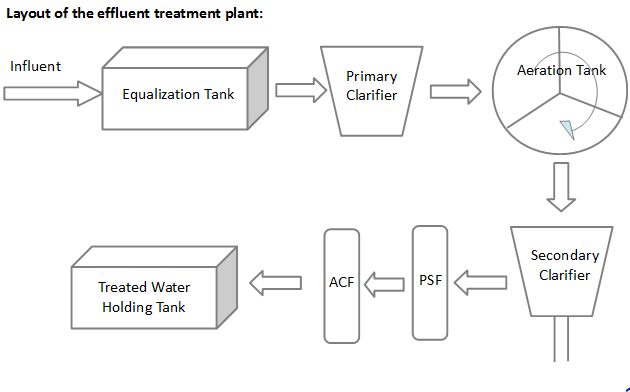 After a detailed analysis of the issues and a review of the effluent treatment plant, we decided on a bio augmentation treatment plan starring CleanMaxx. CleanMaxx is our revolutionary wastewater treatment solution that has proven itself several times over in the past 15 years. A tailormade, heterogenous consortium of upto 76 strains, CleanMaxx adapts well to all conditions and is specially designed for optimum waste degradation in wastewater treatment plants. And while our clients were using a bio-culture in their aeration tank already, with CleanMaxx, the difference was immediately visible. 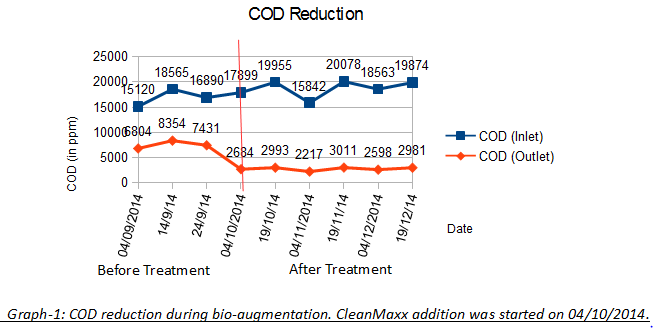 With CleanMaxx, we reduced the COD by 85%, an improvement of 30% over the existing treatment in just the seeding phase. The COD levels were further reduced to meet discharge limits by the tertiary system. CleanMaxx worked wonders on the secondary concerns too. In biological systems, there are several factors contributing to foaming. In this plant, we observed the main cause to be filamentous bacteria in the aeration tank. High MLSS levels – 5000-5500 ppm and excess biomass resulted in a substantial amount of Dissolved Oxygen (DO) being consumed. Things changed with the introduction of CleanMaxx. The microbes from CleanMaxx successfully eliminated undesirable microbes from the system bringing the MLSS level down to 2000-2500 ppm. The DO consumption also reduced because our bioculture can grow and optimally perform even in low DO levels, helping maintain an optimum DO level of 1.5. Effluent from food processing is generally laden with a high proportion of oil. Additionally, our client’s plant also has an edible oil processing unit, adding extra oil and grease to the effluent. Oil and grease are both tough to biodegrade and also form a thin layer on the surface, limiting oxygen diffusion into water. Before CleanMaxx, oil and grease concentration in the effluent was in the range of 200-250 ppm with only 45% reduction. After CleanMaxx, the treated effluent saw a 92% reduction in oil and grease concentration. Our clients were thrilled with the results and their plant is now fully stabilized and working at its peak efficiency.